Dominio Vale do Mondego, situated in the Serra da Estrela, the largest nature park of Portugal, is a working organic/bio dynamic farm with olive orchards and sheep. 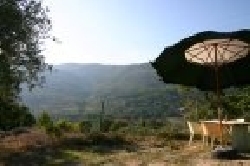 Spread over the large terraced terrain, there are 6 Quinta�s (authentic Portuguese farms) of which 3 Quintas are renovated into aatractive selfcatering holidayhouses. 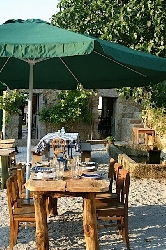 Furthermore there are 2 Cabanas with B&B, the �Lagar Lounge� (dining room/library/billiard/piano/WIFI), terraces, swim basin, panorama terrace, and a rural campsite. One can walk for hours on our own terrain of 33,3 ha, with historic terraces, pastures, wood, olive groves, fruit orchards,fig trees and a herb & vegetable garden. A dirt road leads to the secluded Domain, a beautiful and very private location in the green valley along the river Mondego. The region is famous for its nature walks and historic villages. The highest city of Portugal, Guarda is at a distance of 12 km. Join us for delicious family dinners with fresh organic products. Free use of our open air art atelier. Horse riding on our 2 horses. The Quinta do Rio is a large, beautifully restored Quinta, with direct access to the river Mondego. 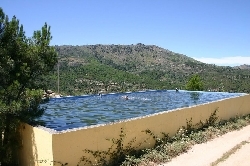 The terraced gardens and terrain (4 ha) has a large private swimming pool and separate children pool, with beautiful views of the valley. 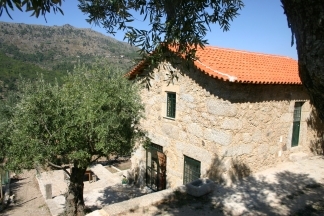 The house, (8 p.) traditionally built with large granite stones, consists of a spacious living room with a great open fire, a fully equipped kitchen with dishwasher, 4 double bedrooms with (2 with double beds and 2 with twin beds, suitable for 2 families), 2 bathrooms with bath, toilet and washbasin. And in the basement there is a large children playroom, 1 showers, toilet and washingmachine. On the covered terrace is a traditional bread oven and barbecue. Flower garden with settees in the shade. Small children play-area. The house has its own clean and healthy drinking water source, besides tap water. 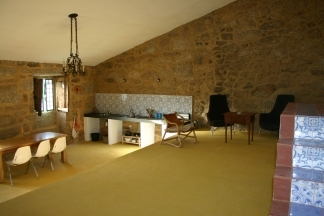 There 2 other smaller Quintas: Quinta das Canas and CAsa das Pombas, each for 4 persons. Please contact us for further details and prices. The prices mentioned here are for the Quinta do Rio. Catharina and Eelco live permanently with 3 children(4-17) on the Domain. 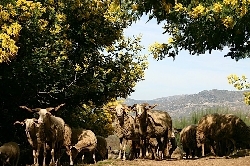 Eelco is expert on organic farming, .The farm has a large flock of the typical Serra da Estrela sheep (160). In our own dairy we make the famous Serra da Estrela cheese. 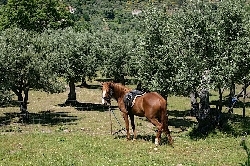 There are large olive groves on the Estate, from which Extra Virgem olive-oil is produced. Organic vegetables and fruit are also grown and for sale. There are great walks on the Estate, along a centuries old path with historic water basins. For children it is great to walk with the donkey. For fanatic walkers the Serra da Estrela region has many long distance walking trails. With our Land rover we can drop you off in the middle of the park. 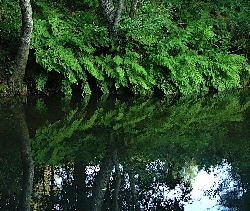 The river with an abundance of water and its pebble beach is great for swimming and fishing. You can join us for a delicious family-dinner with fresh organic ingredients from our garden, served on the terrace of the Lagar Lounge. Small shop. Free use the open air Atelier for painting, sculpting and mosaicing. The rates are in Euros. In July and August the miknimu renatl period is a week. Reservations of consecutive weeks recieve 10% discount. From october - may we offer special rates for longterm rentals. 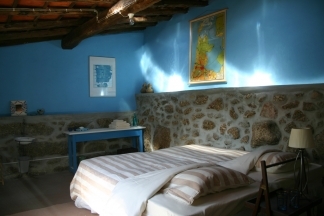 Rental costs include electricity, gas, water (from own source), all (organic) bedlinen, towels and final cleaning charge.